If you are interested in food, come join us by clicking the link above or searching for "RFC on Facebook" on Facebook. After a week of British pub food in London, my family was clamoring for some good ole American BBQ. I fired up the Big Green Egg, my favorite smoker in the world, and cooked us up some brisket and ribs. After 5 1/2 hours, we had some succulent, juicy brisket which I served with oven fries and gorgonzola salad. Below is my original post on how to smoke brisket on the Big Green Egg. Enjoy! I bought my husband a Big Green Egg for his birthday and then proceeded to cook on it a bunch of times before he got to use it. It's not my fault he's had to travel so much for business, is it? Today Mark came home from the grocery store with a beef brisket to try out on the Big Green Egg. My ten-year-old, Christina, showed him how to light the lumpwood charcoal and get it to a temperature of 250 degrees. Meanwhile, I generously seasoned each side of the brisket with a BBQ spice rub, kosher salt, and pepper. You can let it sit overnight with seasoning or even brine it first and then season it. I just seasoned it and as soon as the grill was ready, we put it in to cook low and slow. After about 5 hours, the brisket reached an internal temperature of 197, and we pulled it out and let it rest for about 20 minutes. Boy, was this good. Moist and tender. And we even forgot to throw some hickory chips in there to get some great smoky flavor. Next time. I recommend checking out the blog, Bucky's BBQ and Bread -- Curt helped me out when I first got the Big Green Egg (oh I mean, when my husband got the Big Green Egg). His site is chock full of great BBQ and other delectable eats. 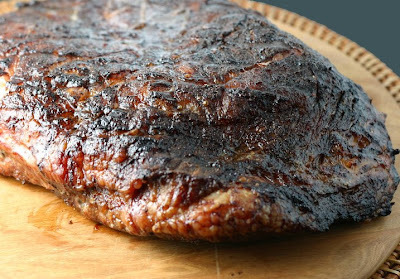 Also, Another Pint Please has a brisket recipe using a brine and the site does a nice job of describing how to cook the brisket on a Weber kettle. If you don't have a Big Green Egg, maybe now's the time to get one. It's da bomb. Score the fat side of the brisket with a cross hatch pattern. Generously season the brisket on both sides with BBQ seasoning, salt, and pepper. Heat the grill to 225-250 degrees. Cook brisket 4-5 hours or until it reaches an internal temperature of 195-200 degrees, turning it a couple times during the cooking process. Take it off the grill, cover it with foil, and let rest about 15-20 minutes. Cut and serve with BBQ sauce. 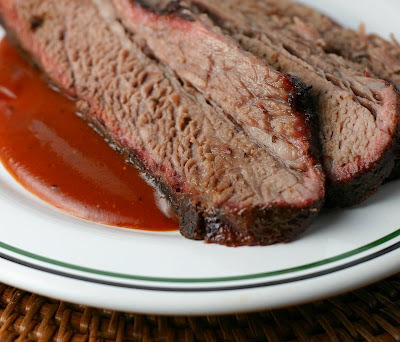 Love BBQ brisket! Will need to check out the RFC group soon.